President Maithripala Sirisena has stated that Sri Lankan media reports – quoting foreign media – on the extradition former Governor of the Central Bank Arjun Mahendran cannot be accepted as an official statement by the government of Singapore. 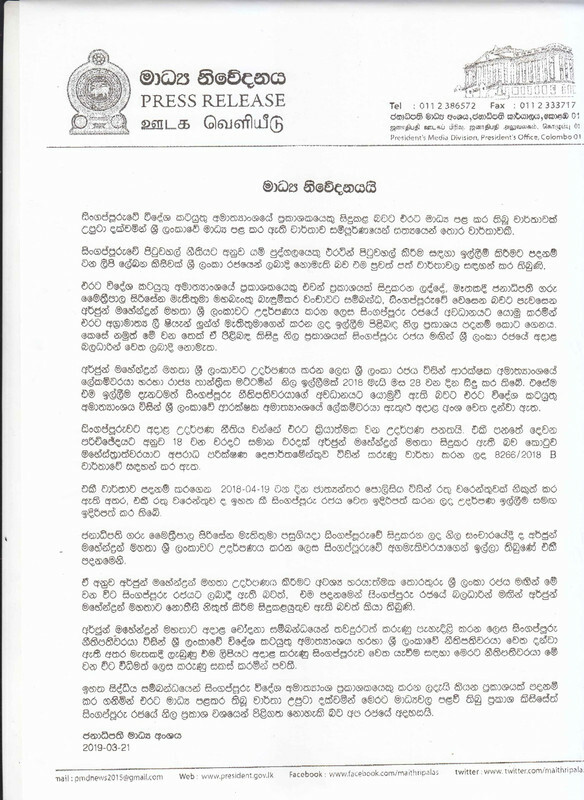 President Sirisena stated today (21) this issuing a press release. After having done all that is necessary either willfully or not, by neglect or dereliction of duty or not, Sirisena who is complicit in both the bond scams – 26 Feb 2015 and 31 Mar 2016 by doing all that is necessary to delay justice is now trying to get some shine into his soiled presidency. He was instrumental in letting it happen and also in allowing one of the culprits escape and in harboring the local mastermind Ranil Wickramasinghe without due legal process. There wouldn’t have been any reason for allowing Arjun Mahendran leave Sri Lanka for he was a main suspect in the Bond Scams. There is little doubt that Ranil Wickramasinghe as the Prime Minister of Sri Lanka and a close friend of Arjun Mahendran did not know that he was leaving the island while implicated and complicit in a major financial fraud. Other people are prevented from leaving the island for much lesser offenses. It is of paramount importance to find and bring to book other government agencies who are complicit in allowing an alleged thief and a fraudster leave the clutches of the Law Enforcement in Sri Lanka. Over and above the monumental damage done to the economy of Sri Lanka, we still continue to spend funds on trying almost in vain to apprehend this culprit. Shame on this man still staying in power, in the position of the President of Sri Lanka, now trying to cover his backside in the last waning days of his ill-acquired glory! Arjun Mahendran should be tried in absentia. Sirisena the Indian puppet is playing games.